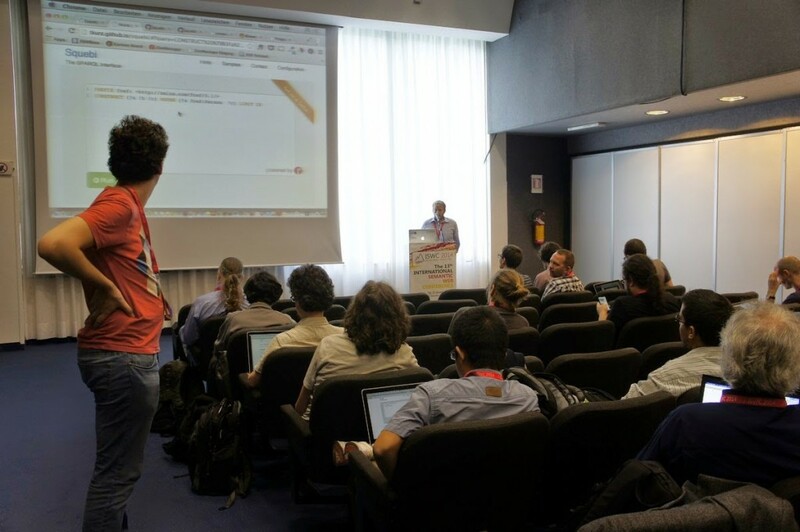 ISWC 2014 is the premier international forum for the Semantic Web / Linked Data Community. There, scientists, industry specialists, and practitioners meet to discuss the future of practical, scalable, user-friendly, and game changing solutions. On Sunday we had quite some presentations at the Developers Workshop: Thomas Kurz and Kai Schlegel showed some of the tools we are building for querying in MICO, such Squebi, Sesame Vocab Builder or balloon; Sergio Fernández discussed about the Commons RDF initiative for aligning the RDF 1.1 Java implementations. More than 70 people attended this very practical workshop. On Monday Sebastian Schaffert, Sergio Fernández, Jakob Frank and Thomas Kurz gave a tutorial about Apache Marmotta to around 25 people, including general introduction, LDP and Semantic Media Management. You can find the tutorial sources at bitbucket. In addition we could also see some related work arround MICO. Rupert Westenthaler demoed the Fusepool Annotation Model which could be considered for annotation purposes in MICO too. At the LILE 2014 workshop Dietmar Glachs, Violeta Damjanovic and Felix Strohmeier, from the Eagle project, presented a position paper proposing to base their platform on Apache Marmotta, which is being build in MICO. We will stay here for the rest of the conference to see some of the latest scientific contributions people are working on. So if you would be interested about MICO, please do not hesitate to talk with us during the conference. Attendees to the Apache Marmotta tutorial at ISWC2014.